We caught up with Scott Carter to discuss his inspiration for the play and writing for great men of history. “Surreal and delightful” could also be used to describe his play, in which the three famous and accomplished men who lived decades and continents apart tussle in the afterlife. This trio wasn’t always the plan, however. 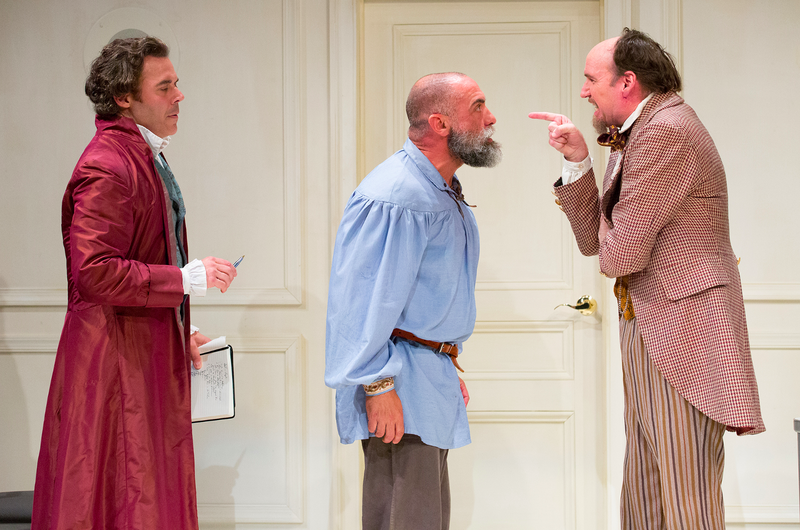 Brian McCann as Dickens, Gregory Isaac as Jefferson, and Andrew Criss as Tolstoy in Lantern Theater Company’s production of THE GOSPEL ACCORDING TO… Photo by Mark Garvin. Now that his three luminaries and their gospels were in place, Carter took nearly a decade to write a complete draft, drawing on almost twenty years of intensive research. The resulting play was 151 pages. But in 2008, Carter went back to this play. “I boiled it down to 49 pages,” he says. Then he brought it to a good friend: Garry Shandling. Carter read the play aloud over dinner, using stick puppets for the three characters. They stopped halfway through so that Shandling could give his notes, and Carter came back the next night to finish. “It was like Scheherazade,” Carter jokes. Carter did many of these readings over the next several years, with and without hired actors. Carter’s long career as a television producer provided him with a wide and experienced crowd to call upon; audiences for these private readings included Norman Lear, Ariana Huffington, and Shirley MacLaine. MacLaine even took Carter to dinner to convince him to include Sir Isaac Newton, who she believed was reincarnated as Stephen Hawking. 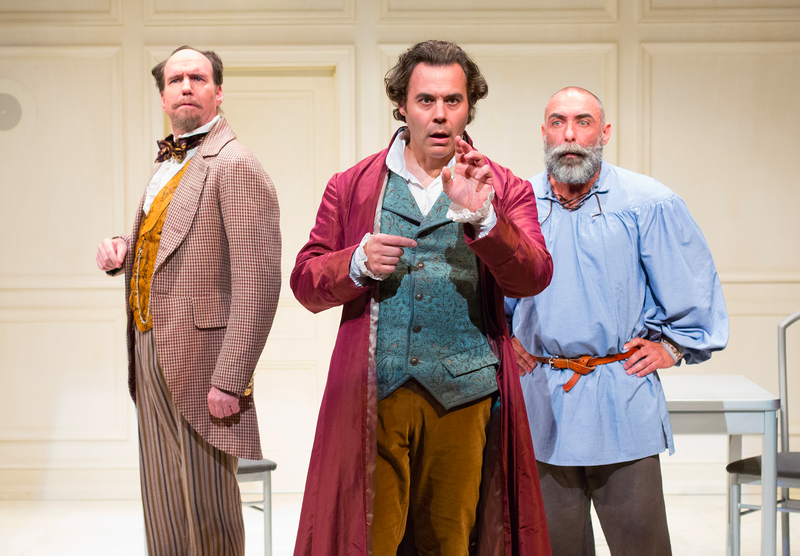 Gregory Isaac as Jefferson, Andrew Criss as Tolstoy, and Brian McCann as Dickens in Lantern Theater Company’s production of THE GOSPEL ACCORDING TO… Photo by Mark Garvin. 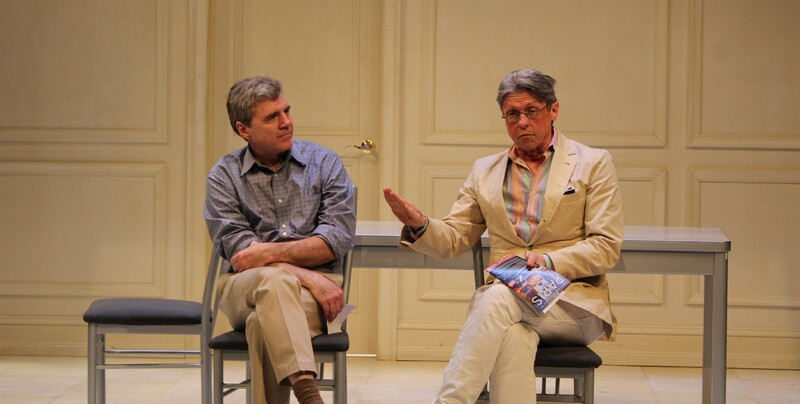 Lantern Theater Company Artistic Director Charles McMahon moderates IN CONVERSATION: PLAYWRIGHT SCOTT CARTER at the Lantern on June 3, 2017. Photo by Alexis Garcia. Carter took audience questions and spoke about the bliss state that led to the play (“It was like the short story, Flowers for Algernon, where this man gets a serum that makes him into a genius, but after a while it starts leaving.”), the history that couldn’t fit it into 90 minutes (both Jefferson and Dickens had pet ravens), and the ending. We won’t spoil it, but according to Carter, it has roots in 2001: A Space Odyssey. “You’re searching for images and actions that feel correct,” Carter says about where the play ends up. Join us for The Gospel According to Thomas Jefferson, Charles Dickens and Count Leo Tolstoy: Discord at Lantern Theater Company, June 1 — July 9, 2017. Visit our website for tickets and information. Thanks for taking the time to read this article. If you enjoyed it, please click the 💚 below so others will see it. Creating intimate and engaging theater in Philadelphia since 1994.